Yay! 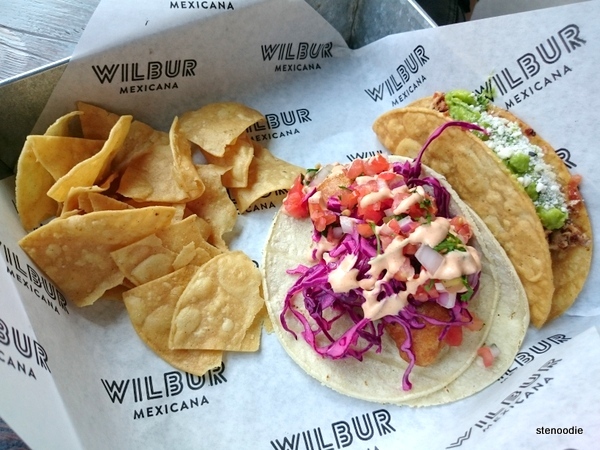 Helen and I finally got to try Wilbur Mexicana after more than a month trying to meet up. Both of us had heard about this casual Mexican eatery on King Street West and had wanted to come here to try it out. 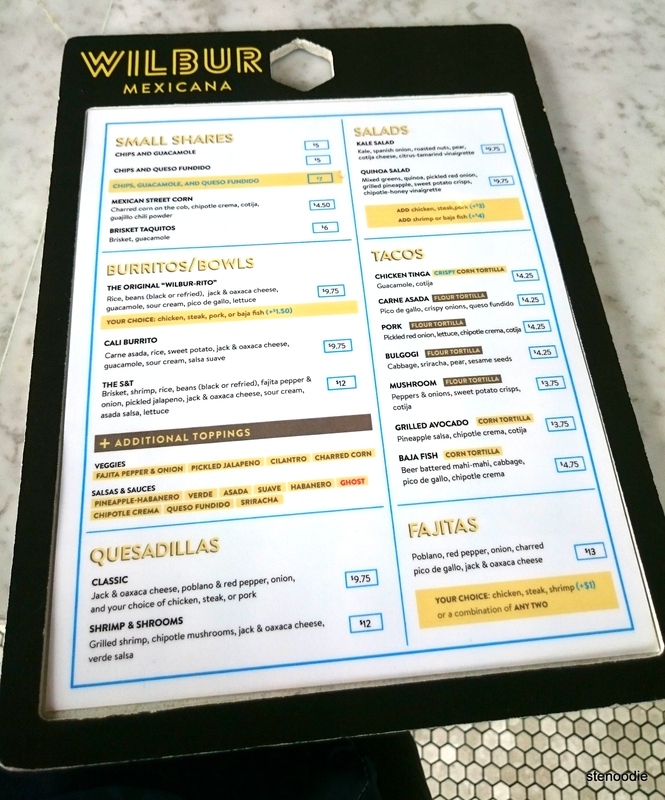 Wilbur Mexicana serves tacos, burritos, burrito bowls, quesadillas, guacamole, chips, a salsa bar, and more! I walked in on a Saturday after my weekly Zumba class at 12:30 p.m. There weren’t a lot of people here yet so my wandering gaze caught the eye of the staff manning the cashier who noticed me and asked if it was my first time there. 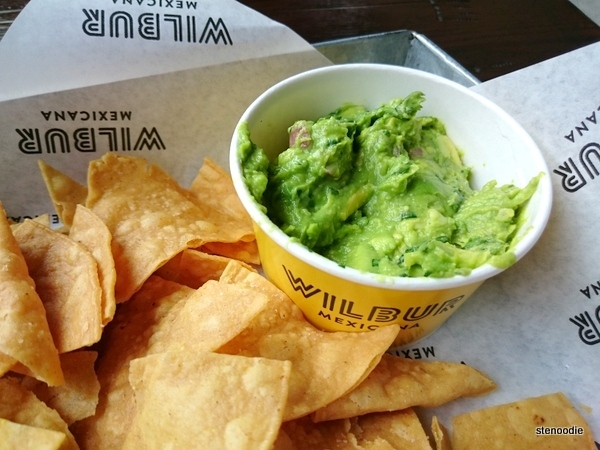 He was very friendly as he explained to me how the ordering system at Wilbur Mexicana worked. Taking the cardboard menu that he gave me, I looked to see what I wanted to order. Then I would order at the counter, take a number, grab a spot to sit, and then the food would be served to me. 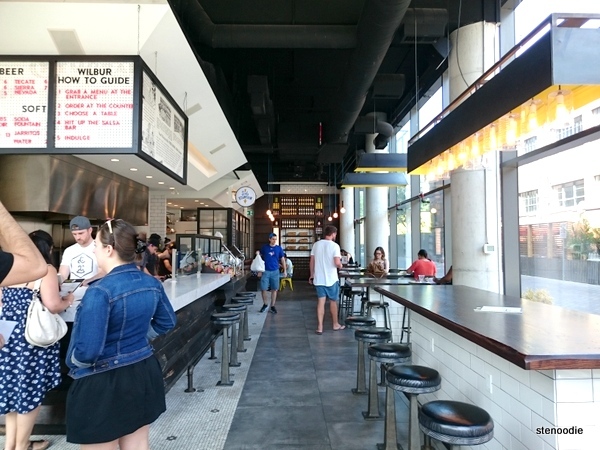 It was a fast casual and simple eatery! There were more than enough spots in the restaurant to choose to sit at too. 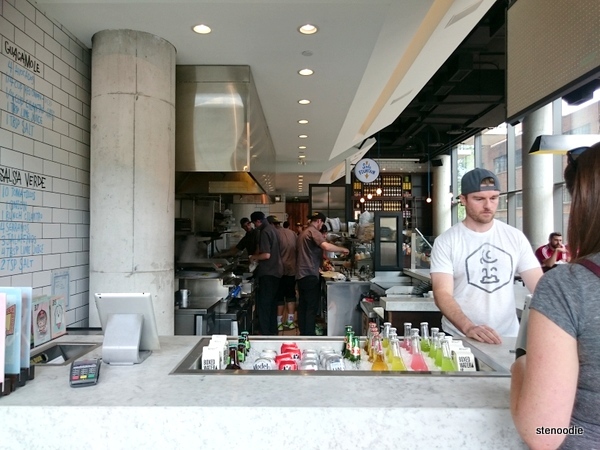 As I noticed during my visit there, they had a very high turnover as well with lots of guests eating and then leaving quickly so even when there was a line-up, it moved quickly and you didn’t have to wait long for your food at all. 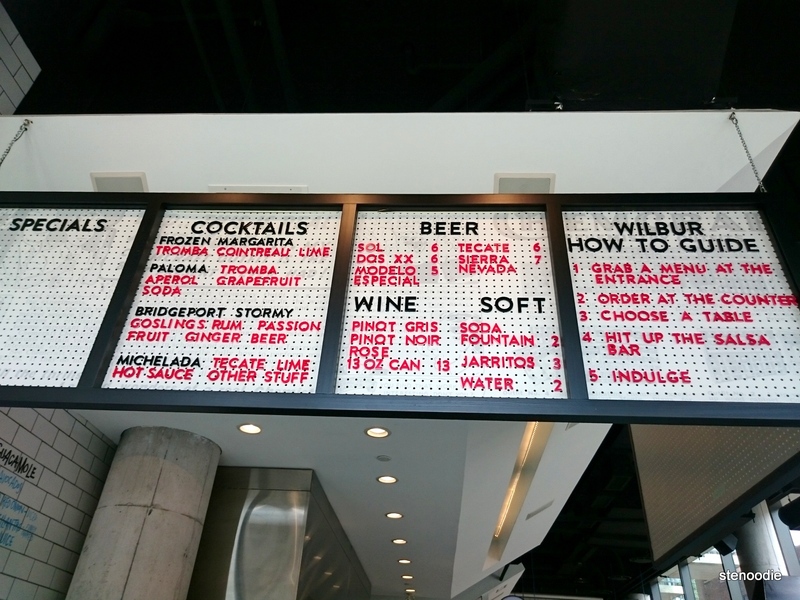 Once Helen arrived, we placed our orders at the counter and then took one of the one-of-a-kind signs that had a number on it to our table and waited for the food. It was funny because before we even sat down, one of the food runners came out with the order of our chips and guacamole. That was fast!! 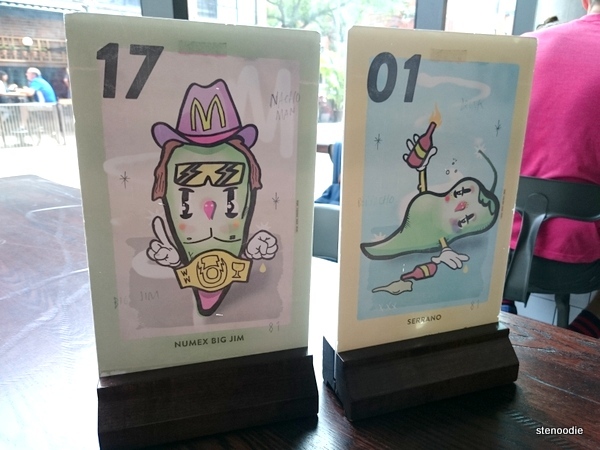 Signs that you place on your table so that the runner can bring you your food. These are super unique! 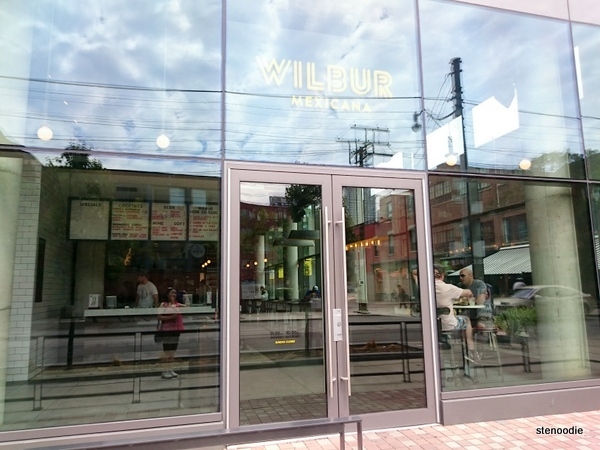 Wilbur Mexicana has a salsa bar that includes seven types of salsa and hot sauce. There were plastic containers for you to scoop up how much you wanted of each salsa or hot sauce to bring to your table to enjoy. 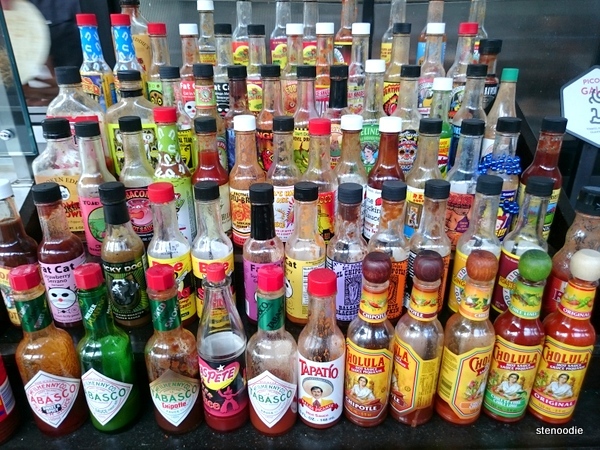 Also, they had a gigantic selection of small bottles of hot sauce and sauces for your tacos and burritos, etc. It was a huge selection! 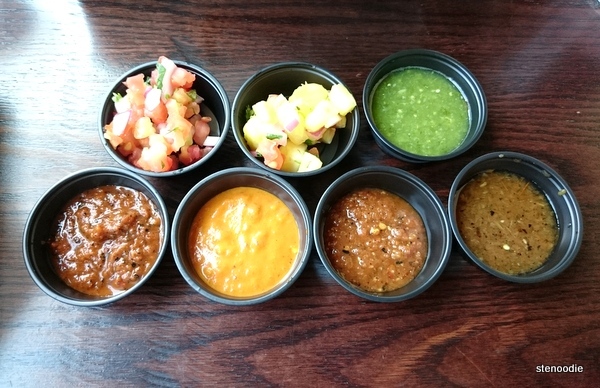 Seven types of salsa and hot sauces, all-you-can-eat style! Their hot sauce collection is most impressive! 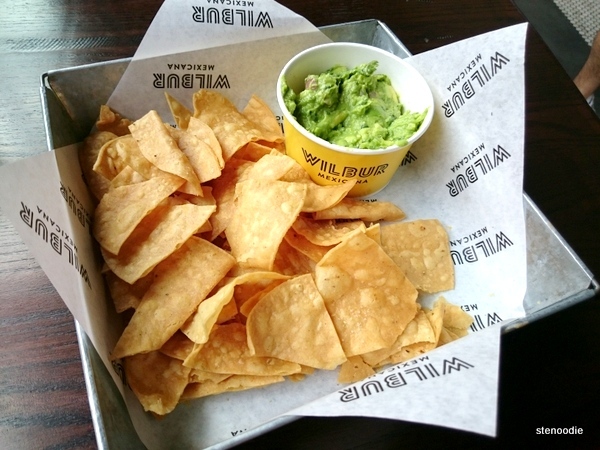 The Chips and Guacamole was a good portion. The guacamole was made with 4 avocados, 1/4 cup of diced red onion, 1 /4 cup of finely chopped cilantro, 1 tablespoon of lime juice, and 1 tablespoon of salt. Yum! The guacamole was indeed very fresh and I could taste the whole partially unmashed avocados in some bites too. It was a very simple guacamole where I didn’t even see much of the diced red onion or finely chopped cilantro with my naked eye. The chips were crispy and dused with just enough salt that after each bite, you had salt on your fingertips. I liked the chips. 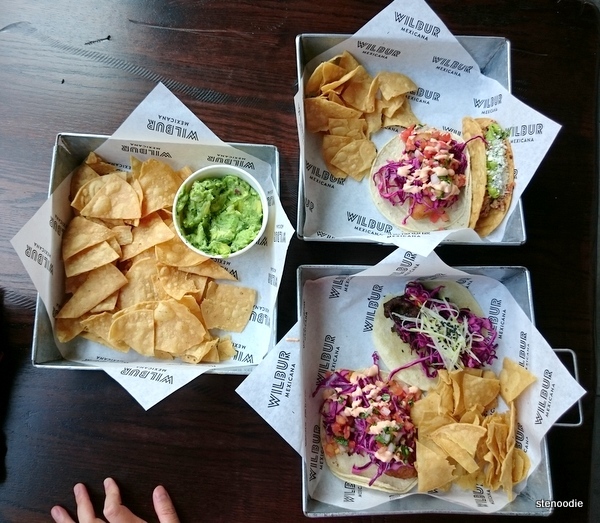 Helen got two tacos, the Baja Fish and the Chicken Tinga. 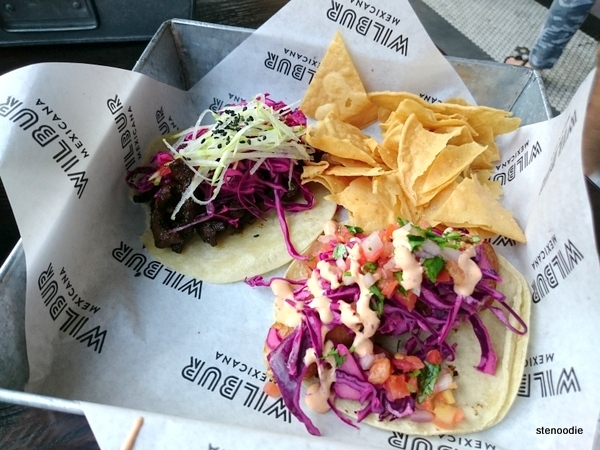 I ordered two tacos, one was the Baja Fish on a corn tortilla with beer battered mahi-mahi, cabbage, pico de gallo, and chipotle crema; and the other was the Bulgogi on a flour tortilla with cabbage, sriracha, pear, and sesame seeds (no mention of the actual bulgogi meat in the menu, interestingly). My order of the two tacos came with some chips on the side too! 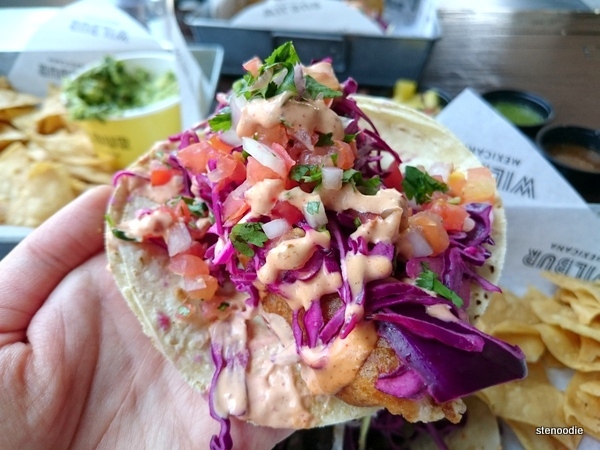 I wasn’t a huge fan of the two corn tortillas that the Baja Fish Taco sat on top of. The corn tortillas were quite dry in my opinion. However, I did enjoy the combination of cabbage, pico de gallo, and chipotle crema that were in this taco. 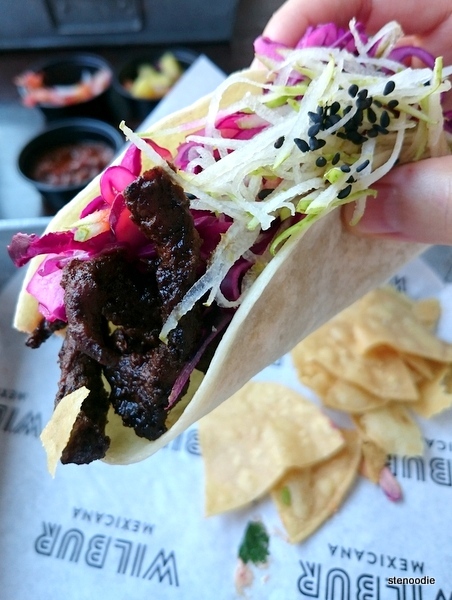 The Bulgogi Taco was better received for me on a flour tortilla — it just tasted more firm and moist. The bulgogi beef were sweetened and the cabbage and pear made it taste very refreshing at the same time. 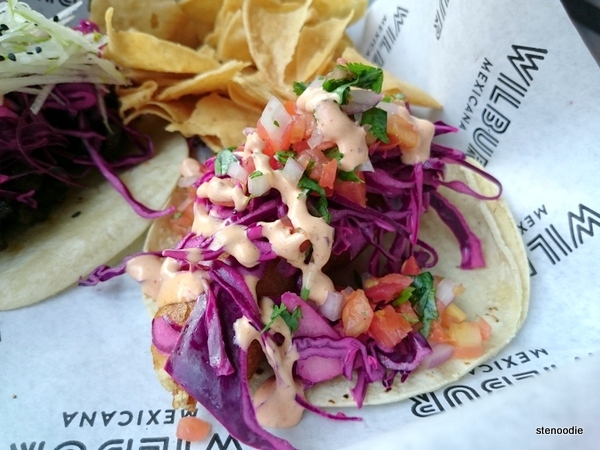 It was a very good combination of tastes in a taco and was definitely a more memorable and good-tasting taco that I’ve had. We took our time eating and chatting (there was also free wifi and the restaurant sat on top of a pokestop). 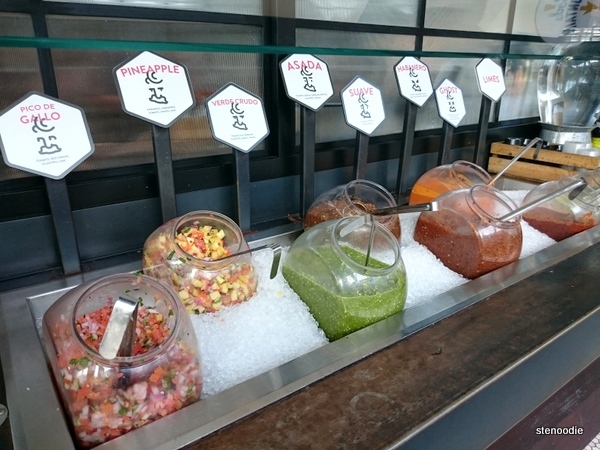 We also took one of each salsa and hot sauce that they had available in the salsa bar to try. I really liked the Pineapple Salsa. Just like someone who commented on Yelp said, I could have eaten the Pineapple Salsa on its own because it was so delicious and refreshing — in fact, that’s exactly what I did haha. I also enjoyed the Verde Crudo which had tomatillos, serrano, cilantro, and garlic onion. It was a very refreshing salsa! I tried the Habanero hot sauce and it was definitely spicy! I found it a tad more spicy than the Ghost pepper hot sauce but also spicy in an appealing way. There were water jugs for you to fill up on for free water. 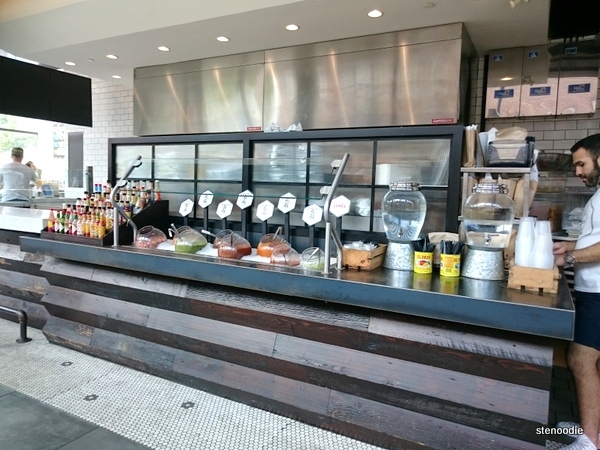 Really sleek, modern, and clean place for fast tacos and Mexican food! 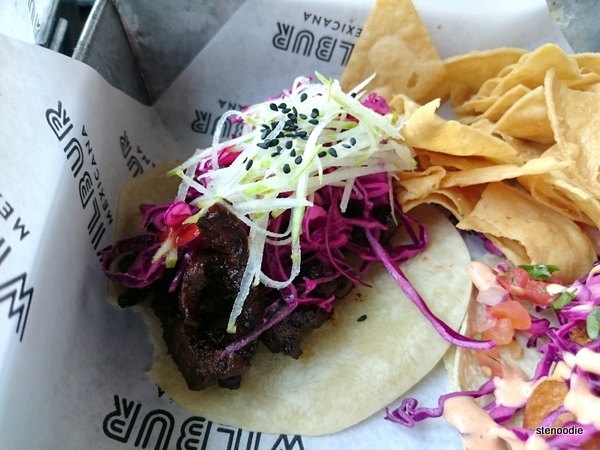 This entry was posted in Food and tagged 552 King Street West, Baja Fish Taco, Bulgogi Taco, Chicken Tinga Taco, Chips and Guacamole, food blog, foodie, free wifi, Mexican, Mexican restaurants in Toronto, pokestop, restaurant review, Toronto, Wilbur Mexicana, Wilbur Mexicana food menu and prices, Wilbur Mexicana salsa bar. Bookmark the permalink.